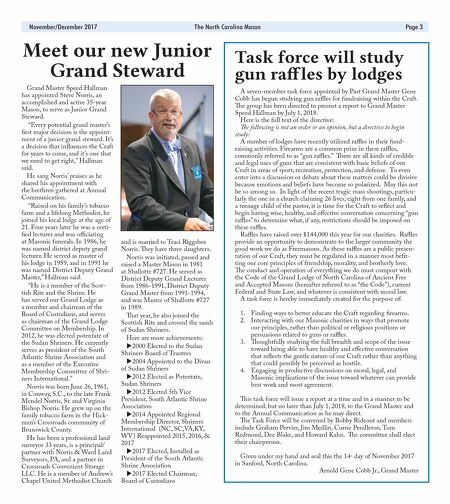 Page 2 The North Carolina Mason November/December 2017 INSTALLATION, from page 1 irrevocable landmarks of Masonry, you are invested as Grand Master of Masons with powers and prerogatives which are well-nigh absolute, but this office also carries with it tremendous responsibilities. You will not only rule and govern, but you must also be the servant of all. Upon your shoulders will rest the grave responsibility of seeing that peace and harmony prevail at all times; that the ancient landmarks, customs and usages of the Craft are carefully preserved; that no innovations are allowed to interrupt the peace and good fellowship which must prevail in the fraternity if it is to continue to command the trust and respect of all men everywhere." Other officers installed were: Deputy Grand Master Dwight "Mack" Sigmon; Senior Grand Warden Paul Shaun Bradshaw; Junior Grand Warden Ralph David Wicker, Jr.; Grand Treasurer Lewis Ray Ledford, Past Grand Master; Grand Secretary eophilus Walton Clap III; Senior Grand Deacon Larry Bogan ompson, Jr.; Junior Grand Deacon Kevan Delaney Frazier; Grand Marshal Donald Edward Kehler; Senior Grand Steward Robert Wayne Rideout; Junior Grand Steward Steve Marion Norris; Grand Chaplain James Grady Jones, Jr.; Grand Lecturer, Donald McLean Helton; and, Grand Tyler, John William Speed II. Appointed officers are: Judge Advocate James Robert Stevens; Grand Orator, Dan Charles Rice, Past Grand Master; and Grand Historian Michael Wiley Brantley. Others on the program included GM Hallman's longtime friend William A. Keyes IV, secretary of the Board of Trustees of the University of North Caro- lina. Keyes not only honored both Speed and Susan Hallman in his remarks, but welcomed Masons on behalf of the University and the board. An honor guard of the North Carolina State Highway Patrol presented the colors in honor of Hallman's uncle, Col. Charles A. Speed, a former commander of the patrol. WB Steve Barrell presented the musical prelude, and Bland Simpson, Kenan Distinguished Professor of English and Creative Writing – and musician – played "the Old North State." Past Grand Master Bryant D. Webster presented the past grand master's jewel to outgoing GM Gene Cobb. e closing charge was delivered by WB Johnny Surles after Grand Chaplain Jones offered the closing prayer. In it, he called on all Masons "to be a beacon of light to dispel the darkness around us." So mote it be. 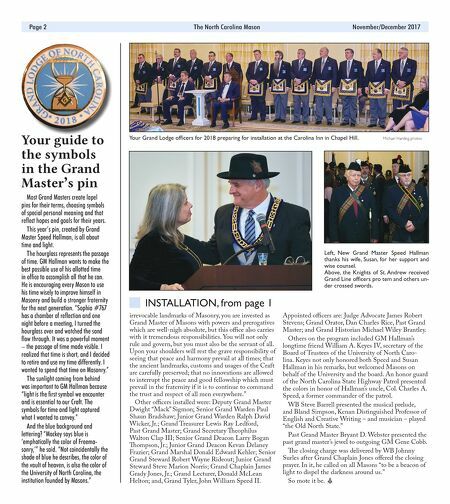 Your guide to the symbols in the Grand Master's pin Most Grand Masters create lapel pins for their terms, choosing symbols of special personal meaning and that reflect hopes and goals for their years. This year's pin, created by Grand Master Speed Hallman, is all about time and light. The hourglass represents the passage of time. GM Hallman wants to make the best possible use of his allotted time in office to accomplish all that he can. He is encouraging every Mason to use his time wisely to improve himself in Masonry and build a stronger fraternity for the next generation. "Sophia #767 has a chamber of reflection and one night before a meeting, I turned the hourglass over and watched the sand flow through. It was a powerful moment – the passage of time made visible. I realized that time is short, and I decided to retire and use my time differently. I wanted to spend that time on Masonry." The sunlight coming from behind was important to GM Hallman because "light is the first symbol we encounter and is essential to our Craft. The symbols for time and light captured what I wanted to convey." And the blue background and lettering? "Mackey says blue is 'emphatically the color of Freema- sonry,'" he said. "Not coincidentally the shade of blue he describes, the color of the vault of heaven, is also the color of the University of North Carolina, the institution founded by Masons." Your Grand Lodge officers for 2018 preparing for installation at the Carolina Inn in Chapel Hill. Michael Harding photos Left, New Grand Master Speed Hallman thanks his wife, Susan, for her support and wise counsel. Above, the Knights of St. Andrew received Grand Line officers pro tem and others un- der crossed swords.